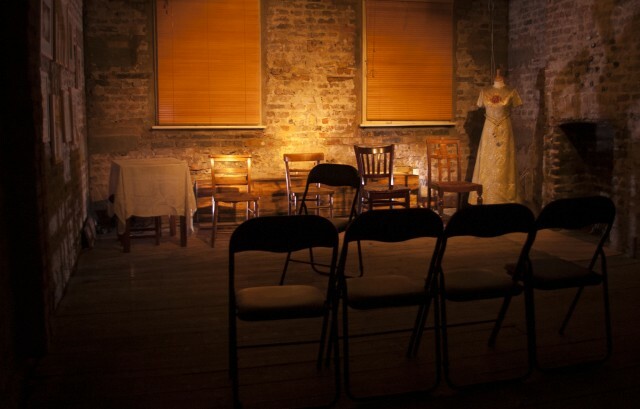 The verbatim narrative that underpinned 'Pilgrimage' was accompanied by four long-durational sound installations in each of the four rooms of Wilton’s Music Hall. These sound works investigated the self-referential and cultural precedents of Pilgrimage, exploring notions of situation, both real and imaginary, acoustic space, and the grain of self-focus. Each room was considered as one quarter of the whole sound composition, in tribute to the tendency of the four rooms to form one aural space – a quality of the acoustics of the beautiful old building and its permeable walls. The composition of the first room, based on hundreds of very short sound fragments sampled from the voyage of Ichi the pilgrim in Kazuo Ikehiro’s 1966 movie Zatôichi Umi O Wataru, isolates and recomposes a pilgrimage that takes place within the medium of film, removing all voices, and focusing on what the fictional pilgrim character, Ichi, might have heard in the seconds between the assembled interactions of this fictional film (his breath, the natural sounds around him etc). The soundtrack to the second room unfolded the rhythmical aspect of travelling, through field recording, polyrhythms and concrete compositional technique. In the third, derived from over fifty film and radio recordings of the comedian Tommy Cooper, we hear the act of performance from Cooper’s perspective, his voice removed, a portrait of his personal pilgrimage for laughter, happiness and appreciation. In the fourth, the listener finds an uneasy rest, with references to scored rearrangements and chance-based extrapolations of Franz Liszt’s ‘Years of Pilgrimage’ piano suites.